Searching the house for birth certificates and medical records is #104 on my list of "Chores I Hate Doing." But today, it wasn't so bad. I found a very cool, archival-type story my mom wrote a while ago about our family's journey back east... and back west, and back east, then even more back east... then back west and then west-er-er. You'll get the picture. So there we were. Living on Route 1 in Round Pond, Maine. It was a large “Cape Cod” house that we had rented. Your standard four bedrooms, hardwood floors, country kitchen, cellar, porch. It sat on thirty acres of land, mostly woods with a stream running somewhere deep into it. I had never seen this stream, as we had landed there in late fall, too late to go exploring. Besides, I was a pregnant, 29-year-old mother of four and trekking around the countryside was not high on my list of things to do. 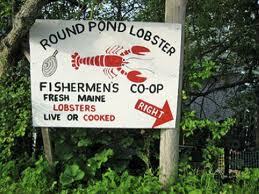 How had we gotten to this place, this wondrous New England town with one country store, sitting half-way down a peninsula towards the lighthouse at the end? We were new there, having just moved from a trailer in New Castle. Residents of both towns shopped in Damariscotta, idyllic and picturesque, sitting on a tidal river. It was 1981 and the shrimp, dug up from the river bed when the tide went out, sold on the streets for a dollar a dozen. LaVerdiere's Drug Store was the hub of activity, as it had a new arcade. PacMan was all the rage. My husband, Clay, worked in the lab at the local hospital. He considered this job a God-send, as we were at the end of our rope, financially, and Clay was so burdened with the care of our family. We had moved to Maine after a whirlwind tour of the country, trying to be Christian missionaries. At first, we were taken aback by the group's devotion to God. One lady plopped herself down on the couch after the meeting and remarked, “Ain't God good? !” We weren't sure she was quite in her right mind, but, after time, we found out that she was right! We plunged into fellowship with these great believers and discovered the truths of the Bible. Oh, how glorious a time it was, to know that Jesus was really alive and truly loved us. That He, the Son of God, had actually lived on Earth for 33 years, then died in our place as payment for our sins, and rose to live forevermore. All we had to do was believe in Him. Clay and I were so enthused with our new life that we decided to try to have another baby to see what it was like to raise a child from the beginning as Christians. Thus, Sheila was born. She added so much to our family and life was good! We got involved with a missionary group, Youth With a Mission, also know as YWAM, and put our children in the school they provided for the community. YWAM is an international group, but their North American headquarters were based in Solvang. When they decided to move their base to Texas, we prayed about it and sold our house in order to go with them. Our plan was to use the equity from our house to fund a Discipleship Training School in Texas and then to be on staff to train others to be missionaries. We bought a 22-foot travel trailer and station wagon and off we went with our three children. I was also pregnant again. Clay and I loved every minute of the school, even though it was hard living in the trailer park. Our kids were still in the same school, which moved with the base, and Sheila was in the daycare program. We had it all worked out how we were going to do this, even though lots of people thought we were crazy! But then one day, I was sitting in the front row listening to a speaker from Holland tell us, “Love means doing what's best for the other person.” Immediately I knew that I could not continue on with plans to go deep into Mexico on the two-month outreach trip which followed the classroom training. We would possibly be sleeping in tents and I might have my baby in pretty poor conditions. We were to be four hours south of Brownsville, Texas, and our plan was to drive there when I went into labor. But, what if the roads were bad? What if the baby didn't cooperate by waiting to get to Brownsville? So, we left Texas when the classroom training ended, with the intention of delivering the baby back home in California and finishing our school by meeting up with another outreach group in eastern Canada. All went well. We rented a house in Santa Paula, Clay got a lab job and sweet Mary was born. But, with four kids, it became clear that the eastern Canada trip was not going to happen. So, we went to a Bible College in Omaha instead. I was getting very good at following Clay's U-Haul in the station wagon with Mary next to me in her old-fashion car seat that hooked over the bench seat, while the other kids rolled around and played in the back, with no seatbelt restraints. We thought it would be good to get to Omaha early so Clay could get an afternoon job, as in two months we were to go to school in the morning. The college housed us in an old, old house in an alley. It was hot! We lost two-year-old Sheila the second day we were there. Nobody from the school helped us look for her, but some little old ladies found her on a boulevard near our house and were driving around trying to find who she belonged to. We were so alone as we were the only family going to the school. It was hot! And then the ceiling fell in on us while we were sleeping. That was the end of Omaha. We had already sold everything we could, so we cashed in our car for a less expensive one and used the rest of the money to get back with YWAM, this time in New Hampshire. But when we got there, there was some miscommunication and they weren't prepared to receive our large family. My aunt lived in Portland, Maine and had a cottage on a lake. She let us stay there while we regrouped. We had not a dime left and Clay was coming back from a disappointing job interview far to the north in Bar Harbor. He cried out to the Lord, pleading for Him to help him. He saw a sign on the road that said “Hospital." He stopped at a pay phone to call and asked if they needed a lab technologist. They did and had been looking for a Chief Tech for four months! Needless to say, Clay got the job and we settled in Maine. We loved the culture. The people were so charming and quaint, and they sure loved their gardens. Our neighbor was a lobsterman and his traps were the “fence” between our houses. We rescued a wild cat from one of his traps and kept it as a pet...and one day it's ear fell off because of frostbite. There are so many fond memories of Maine, from homemade ice cream stands in the summer to the kids ice skating on the puddles in our yard in the winter. But mostly, the people were what endeared us to Maine. One woman I will never forget was my neighbor, Gail. She knew my plight of being pregnant and sick, with four little kids, and she just pitched right in and helped me all she could. Times were still tight and we just couldn't afford life in Maine. The heating bill alone was $1500 a year, and that was in 1982! Also, I was getting weary of being so isolated. I remember getting a Christmas box of gifts from my family in California. I just broke down and sobbed! And so once again, we moved on, this time back to Texas, to try one last time to connect with YWAM. We so desperately wanted to be in full-time ministry. And by hook or by crook, with God's help, we were going to manage it! As one can well imagine, this move did not work out either. Darling Grace was born and I was tired. My children were attending their original YWAM school, but it was 32 miles away from the hospital where Clay found a job. It was exhausting trying to fit a square peg into a round hole! So we gave up and went back to California. We have been in Orange County for 29 years now. Our children are grown and married. We have 9 grandchildren. They are all following the Lord. Three families are in some form of ministry, and our daughter, Grace, is in YWAM, serving in Taiwan with her husband and children. And that, folks, was my life - age six through ten. Make anyone dizzy? So many things I could insert throughout each paragraph, but where to begin? I will point out, lightheartedly, that there must have been something about my older brother and I that made our parents want to start over... "Clay, I just don't know with these two, so let's try this again, and again and again!" And so very glad they did. I LOVE this one! I live that we have Mom and Dads story written down.. Thx moll!